The question arised many times in me about the Individuality of a man, and till now, I was convinced neither with the exsisting philosophies nor have I realized anything. 'What do I do on my own?, is the question, excepting a mere cry after my birth for something, unknown at that time, and, as part of thinking process, the first thought arose, may be the first questioning 'where? ', when I was seeking for food, then might came the powerful thoughts what and why. May be the cry after the birth (when we had no individuality and were dependents,I think, you shall agree with this) was because of the strong intention to be at the breast for food to satisfy the feeling of hunger, and, for a shelter to be in the mother's lap, and now, cloth is added. 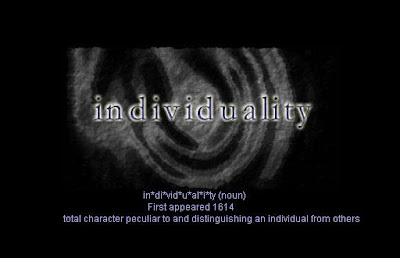 Does individuality mean acting with our own thoughts? If yes, then, own thoughts must be pure, and if yes, pure thought must be simply the first thought. These thoughts, now eating my mind, would be and are the mere imitators of parents, friends and some books, and if yes, the question of individuality arises again. I do have my individuality now, which is, for me, nothing but either accomodating the situation for the self or moulding the self according to the situation . hmm.. so i found da real man in r@ul.. vat u see n vat u xperience in da daily life is not da real things happenin in this Earth PLANE!! IT IS MEDITATION THAT BRINGS U OTHER THAN ANYTHIN ELSE NEARER 2 TRUTH.. Here vat i mean "truth" is nt abt vat u see n vat u learn,hear,do etc etc.. its da truth abt ur own Existence..
y did u take this birth?? birth n death ofan individual is passin thru different MENTAL PLANES which undergo different experiences at each cycle.. I can cite a lot of examples 4 this which u may ask if u r interested..
Our country is not only rich in its past history n heritage it enjoyd but also 4 providin essential knowledge abt what how of existence concepts..IM very clear abt this concept coz i've already done sum work on dat.. I thnk this is da sole reason y INDIA is considered as da SPIRITUAL HEAD of da world..
unconscious ones vch lie still deeper vil play a vital role in keepin u as an individual in a particular position at any instant!!! hope u continue ur journey towards da REALITY vth more intensity, zeal, courage..